The wind will carry you Dead Down Wind, but DDW is slow. DDW is especially “slow” in a fast race boat sailing against similar boats that are using narrower wind angles to generate more apparent wind and additional speed. But would it be possible to create a contraption that captures the wind and uses it (the wind and only the wind) to go DDW faster than the wind? At this point, I know by report that the answer is yes. But I’m writing in haste, throwing desert gear into a duffel bag and preparing to head out to the California dry lakes to act as a timer on behalf of the North American Land Sailing Association and the Blackbird project. Here is a cut and paste that sort-of explains things, for the time being . . .
As a sailor for more than 30 years, Rick Cavallaro was well aware that sailboats can go faster than the wind when sailing across the wind. He then got to wondering whether it would be possible for a sailboat to sail downwind at an angle such that the boat’s direct downwind progress would be greater than the wind speed. With just a bit of research, Rick learned that ice-boats and land-yachts do this routinely. He realized this meant one could release a balloon and race it by tacking downwind in a land yacht—and the land yacht would win the race handily. 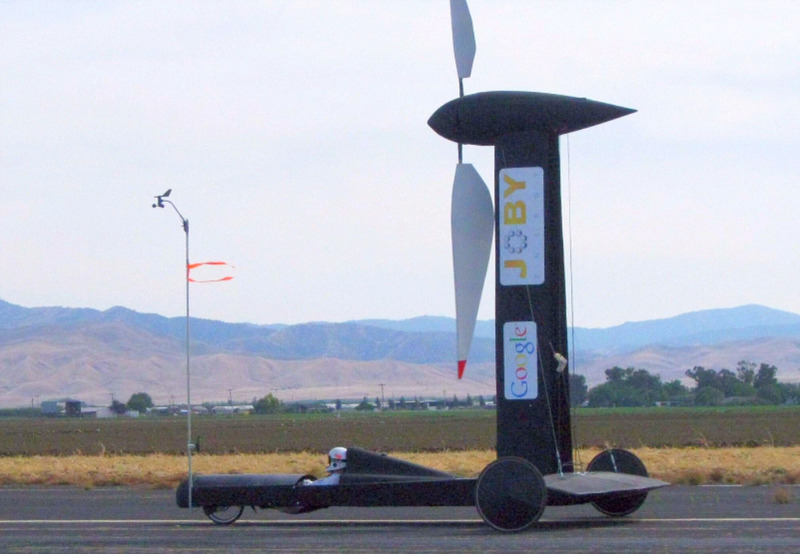 Given his love for brain-teasers, and this new knowledge of something that seemed somewhat counterintuitive, he wondered if it would be possible to design a vehicle that could use the same principle to go DIRECTLY downwind faster than the wind. With a bit of thought it occurred that one could reproduce the aerodynamics and physical constraints of the land-yacht by simply having the sail follow a continuous downwind tack, while winding that tack into a spiral. Two such sails would simply form a propeller. By gearing this propeller to a set of wheels, the designer could constrain it to follow the same downwind path that the sail of the land-yacht follows on a steady downwind tack. So it seemed such a vehicle could in theory be constructed quite simply. What he got, however, was surprising. This problem raised a stink that ran across thousands of pages over countless internet forums. Many people (including some aero and physics PhD’s and professors) were absolutely certain it could not be done. Many were insulting of Rick’s intelligence and sanity. Next report: from the California desert.